Isn't it funny how whenever we go shopping we'll try on 5 different outfits but go back to the first one we saw? I've found that I've done the same with my foundation. Lancome 24 hour foundation was my go to for years and then with bloggining and youtubers and what not I deicide to start trying many others. But when I found myself out of foundation (concealer, deodorant and eyebrow product!) I just wanted to go back to my old favourite. 2015 was the year for HD skin, razor sharp cheekbones and everything on fleek. As fun as make up is and as much as I love applying it and playing around, I noticed my wallet getting significantly lighter in a shorter space of time. I have a feeling that in 2016, everything's going to go more natural. And if not I think I want to be anyway. Lancome 24 was one of the first high end foundations I bought repeatedly. It has everything I want in a foundation. Good coverage, without looking cakey. Long lasting without feeling heavy, and glides on the skin beautifully without a primer. 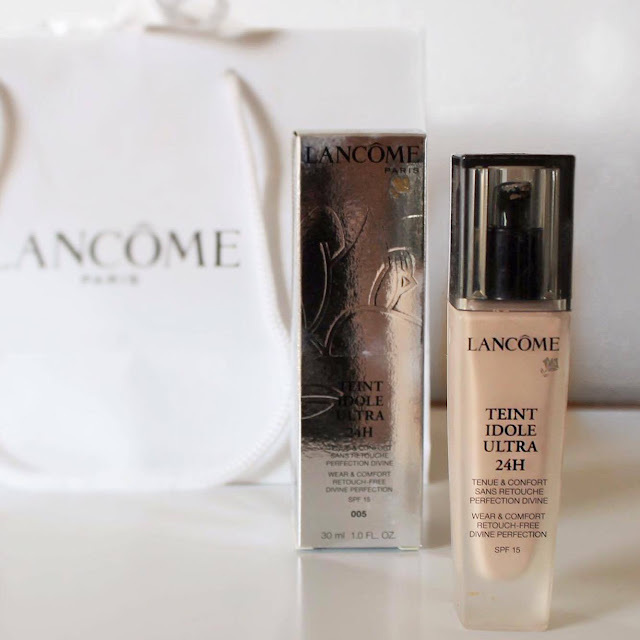 I use shade 005, the lightest shade with yellow undertones and it suites my skin beautifully- a perfect shade match, Something I've always rated about Lancome is their products are suitable for so many skin tones, very pale or dark. On the pictures below my right hand side has the foundation applied to it. The differences in my face are subtly, but this is exactly what I was after. A foundation just to blur out imperfections and act like the corrector tool on photoshop, not a product to make me look non human. The thing about this product is it serves it's purpose. The foundation makes you look like a better you, not somebody else which make up seems to be doing these days. Now if you like to wear heavy make up please don't take this as an attack on what you want to wear! Wear make up how you like if it makes you happy. Just a personal preference is to look like an enhanced version of myself during the day which is what this product does perfectly. Something interesting about Lancome 24 is how you apply it really changes how it looks on your face. For the last year I've been faithful to my Bobbi Brown full coverage brush. However, the Lancome 24 foundation and the brush are not a match made in hevan. I don't know why. It just doesn't work well. I much prefer using an old school foundation brush to paint it on. The Foundation retails at £ so although it is high end, you get what you pay for. The tiniest drop goes the longest way and unless you're doing some for a rigourous activity there really is no need to keep reapply throughout the day. One bottle of this will last me months, it's seriously good stuff.